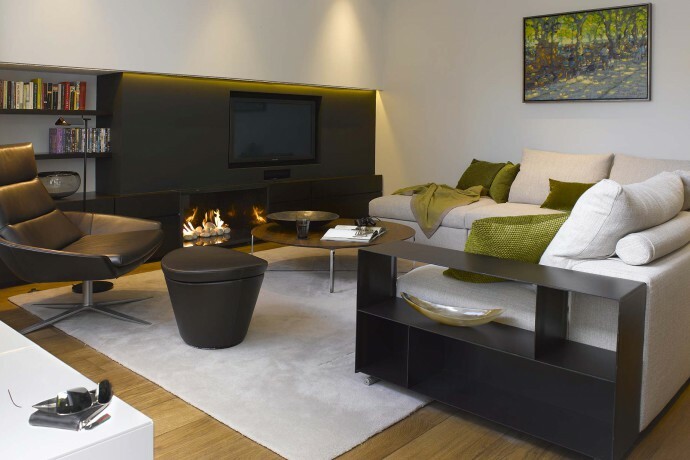 Callender Howorth specialises in luxury interior design in West London and beyond. Our West London interior designers have built a reputation as highly skilled interior design professionals, whose bespoke solutions impress our discerning international clientele. Our diverse portfolio of interior design projects reflects our respect for our clients’ vision and we work in consultation with them every step of the way to deliver excellence from original concept to the completion of projects. Whether you are interested in interior renovation or design in West London, we invite you to browse our completed projects in the area and set up a complimentary visit of your property. Our West London interior designers recently transformed a Chiswick house that hadn’t been renovated since the 1980s into our client’s dream property. The house was located in a leafy suburb with a south-facing garden directly backing onto the Park, so we designed a large kitchen/dining room at the rear for the family to enjoy the stunning views. Since the kids are sporty, our client prioritised practicality and comfort with a shower area alongside the back door and laundry room with lots of storage for sports gear. However, the house still retains a luxurious feel overall with modern furniture and contemporary art installed throughout. We also undertook an interior design project in Holland Park where we linked a house on Princedale Road to the mews house behind it via an enormous basement conversion. Our team of interior architects completely renovated the basement into a spacious, bright vaulted space that lies between the two properties under a garden. The new space includes a stunning kitchen, dining and wine area as well as a TV room, media room, library and a guest suite. West London is home to some of the most beautiful buildings in London and it encompasses an eclectic mix of classical and bohemian style. Notting Hill is a vibrant urban area full of Georgian, Edwardian and Victorian houses that surround some charming residential squares and gardens. Grade II listed building St Peter’s Church is located close to the striking Gothic structure of St John’s Church, originally built as the centrepiece of the Ladbroke Estate in 1845. Holland Park is another of West London’s most treasured areas and it surrounds a Jacobean mansion called Holland House which was a base for political and literary activity in the nineteenth century and remains an inspiration for West London interior designers. The most popular part of the park is the Kyoto Garden which was opened in 1991 as a gift from Kyoto to commemorate the long friendship between Japan and Great Britain. Is West London close to museums and exhibitions? West London has access to some of the best museums in the city and some interesting cultural sights too. Buffered by colourful houses, Portobello Road is the location of the world’s largest antiques market with over one thousand dealers selling every kind of antique and collectible. The Museum of Brands is just around the corner from the market and is heaven for anyone who loves advertising, shopping or collecting things. It’s a treasure trove of retro design and nostalgia that takes you through decades of goodies from chocolate wrappers to automobiles and contains more than 12,000 original items. The Serpentine Gallery hosts a number of live events relating to literature, film and performance art in the beautiful setting of Kensington Gardens. Chelsea Physic Garden is another beautiful green space of historical significance and is famously the second oldest botanical garden in Britain (founded in 1673). Located close to the Thames, the river’s warmer microclimate allows many non-native plants to thrive. Interesting dining options are abundant in West London and one of the most sophisticated is The Orangery. The sophistication and style of style of Kensington Palace has rubbed off on its elegant restaurant whose 18th-century walls were once the setting for Queen Anne’s lavish court entertainment. Today, patrons can enjoy the simple menu of delicious English dishes or just come for an afternoon of English tea in a beautiful setting with an amazing view of the gardens. For a more contemporary dining experience, head to the Foxlow Restaurant which serves meat dishes and cocktails in a relaxed but stylish interior created by cutting-edge West London interior designers. La Trompette is another prestigious Chiswick dining establishment, but one that has been showered with accolades for its high-end French fare, modern kitchen and customer facilities. It was completely refurbished by West London interior designers in 2013 and its new look of muted colours, sleek lines and warm lighting provides an air of understated glamour to match the delicious cuisine. Why do you want to live in West London? What famous people live there? West London is a wonderful area to live in if you love culture and close access to central London. It’s particularly appealing for those with families since it also has many well-respected local schools including Lady Margaret’s School for girls in Fulham and the Sacred Heart School in Hammersmith. It also has a number of good high schools such as Hurlingham and Chelsea Secondary School, and the mixed community sixth form, both located in Hammersmith. Famous West London residents include Robbie Williams, Elle Macpherson and Stella McCartney, who have probably enjoyed the creative assistance of West London interior designers.